Got my copy of Mafia 2 CE in the mail the other day... not sure if the extra cash was worth it for the CE... as there is very little included. 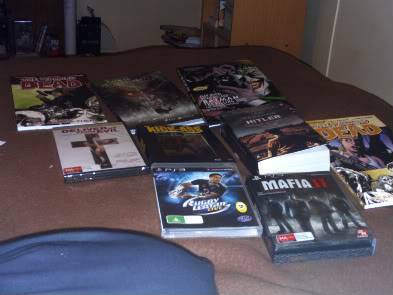 some stuff i have bought over the last 2 weeks. Dude, that Arkham Asylum book is tight Major kewl. I've yet to see kickass... but I've got it downloaded so all I gotta do is make time. and this kewl little pack that includes 12months of XBL gold, a headset, chatpad and PGR4 for $79 which is superb considering that 12month of XBL gold here in canada is $69 alone. So it's allready expensive up there, looks like you got a good deal. I like PGR, especially for what looks like its free with the other things thrown in. It's really annoying typing stuff out when people don't have a mic, I might look at getting one of those. well i picked up futurama season 1 and Rescue Me season 2. Yeah and if you compare it to the price of 12months of xbl alone... there's quite a bit for free in the box Rather, it's a superb deal. I let a cousin of mine know of the deals the story was having. He's been looking to upgrade his 20gb hdd on his 360 but didnt want to spend $100+ for the damn thing. Same store had a sale on for 60gb hdds and a 3month card of xbl for $63. Not a massive deal but still much better than it was originally. Damn microsoft knows how to charge for small things... hell I put a 250gb hdd in my ps3 for about $90 about two years ago. You guys sure put a lot of stock in Dexter, what makes it so good? Dexter himself? I dunno dude. I've heard about the show for a long while now and it wasn't till a random viewing of a few eps while looking for something to watch one night, when I got hooked. It's just a well crafted show where you really get to follow the main character, root for him, cringe at what might happen etc. Even right from season 1 it's superb. Check out the pilot and a few eps of the show, you may like it. I got chuck under a recommendation from a friend, hope I can dig it as much as dexter. i need to watch chuck. i ordered the shield season 7 recently another great show. picked up some graphic novels. deadpool classics, y the last man book 2 and the boys volume 4. Also picked up Eyepet... soemthing I wanted to try for a while. 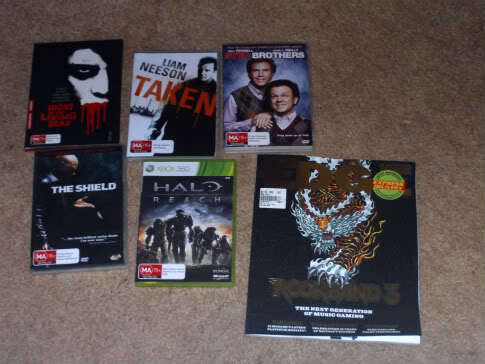 taken, step brothers and night of the living dead (bought 2 got 1 free. yeah why not i just need more pratice at halo. true we have to do it some time. in the mail i got x-men volume 3. retro x-men. i got a book with the first 3 books of dexter, still got to read it. Im pumped to see how similar they are. They're not huge books by any means tho, so I doubt it'll take long to get thrrough them. i preordered Medal Of Honor, AC: Brotherhood and GT5.